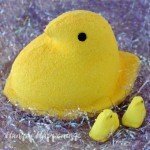 February 1, 2016 By This post may contain affiliate links. 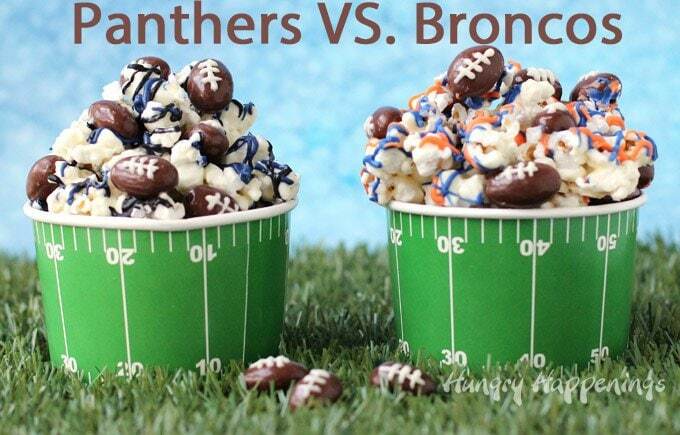 Snack on some Super Bowl Popcorn with Chocolate Almond Footballs while cheering on your favorite team. 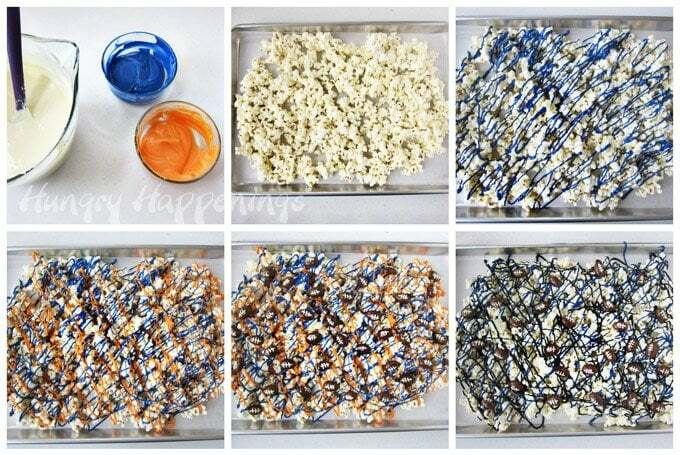 Make and decorate your white chocolate popcorn with drizzles of orange and blue if you are rooting for for the Denver Broncos or with blue and black if you want the Carolina Panthers to win. Whether you are hosting a Super Bowl party or just hanging out at home to watch the big game, you need to make this white chocolate popcorn to munch on. It’s addictingly good and colorful and fun. 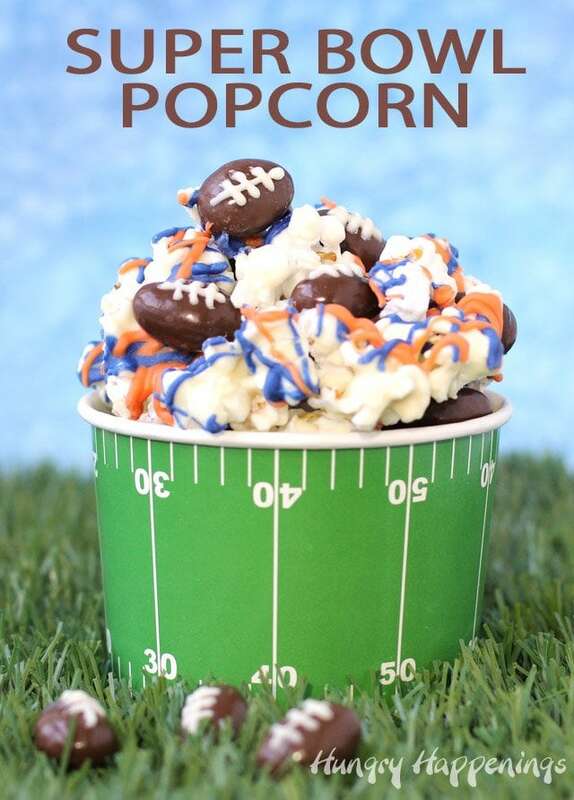 You can make your bowl of popcorn with your favorite team’s colors and if your spouse or friends like the rival team, you can, if you are so inclined, make them a bowl featuring their team’s colors. 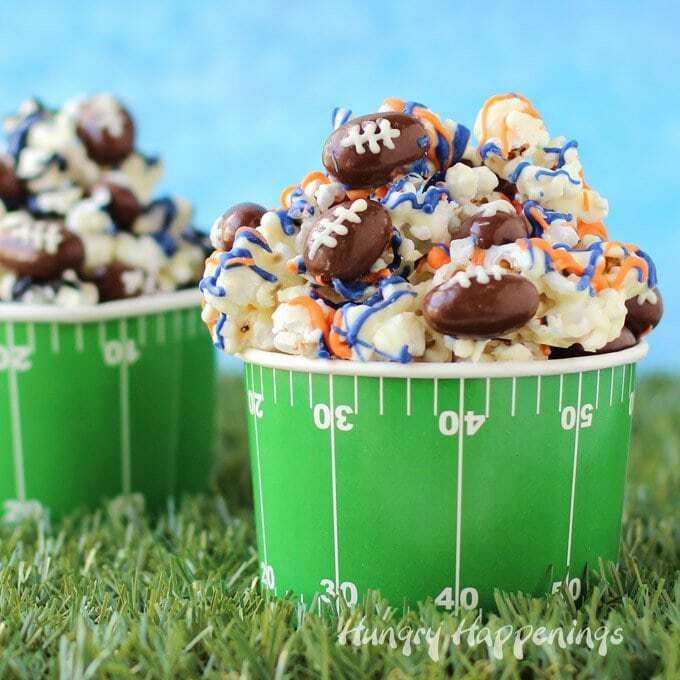 We have some Bronco’s fans in our family, so their bowls would definitely be filled with white chocolate popcorn drizzled with orange and blue candy coating. 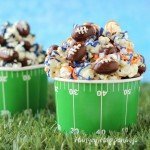 To make the popcorn even more festive for Super Bowl, be sure to toss in some chocolate covered almonds that have white chocolate laces piped onto them. They are a great compliment to the flavor of the white chocolate popcorn plus they add another level of crunch to the Super Bowl snack. 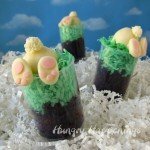 Pour the melted chocolate into a Squeeze-it Mold Painter (a squeeze bottle fitted with a small round pastry tip) or into a pastry bag or zip top bag (snip off a very small hole at the tip) and pipe one line down the middle of each almond then three lines going across. 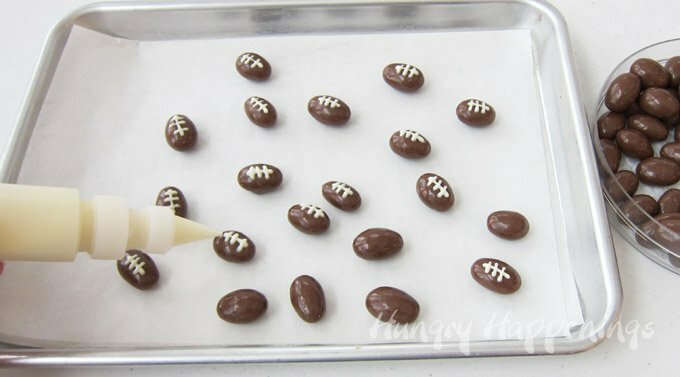 Allow the white chocolate laces to harden and the chocolate footballs are ready to be added to a batch of Super Bowl Popcorn. The best thing about this recipe is that you can make a huge bowl of popcorn in very little time. Adding the laces is the most time consuming task, but I got a pound of almonds decorated in less than 10 minutes. I like to use air popped popcorn to make my white chocolate popcorn, but microwave popcorn works fine too, just avoid popcorn that has a lot of butter on it. It will be too greasy and the white chocolate wont adhere to it well. Start by placing your popcorn in a really big bowl. Melt and temper pure white chocolate or melt white confectionery coating wafers. See my Chocolate Making Tips page for detailed information about working with and melting these two types of chocolate. 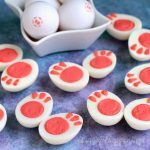 At the same time, melt orange and blue or blue and black colored confectionery coating wafers or color some white chocolate or white candy coating with your favorite team’s colors using candy coloring. Pour the white chocolate over top of the popcorn then toss just enough to coat the popped kernels. 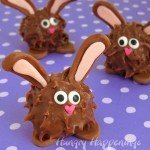 If you toss too much, the chocolate will harden. Immediately, pour the white chocolate coated popcorn out onto a parchment paper lined baking sheet and spread into an even layer. Drizzle your team’s colors over top. I like to pour my colored candy coating into a disposable pastry bag and drizzle it over the popcorn but a spoon works too. While the chocolate is still wet, place chocolate almond footballs over top. Refrigerate the popcorn for about 10 minutes until the chocolate hardens. Break the popcorn into chunks. If you want to add a bit of silver to your Carolina Panther popcorn, you can brush some edible silver luster dust over the popcorn. It’s not very apparent in the pictures, but in person, you definitely notice the silver. 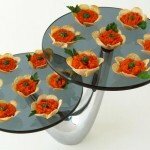 Fill big bowls or small individual serving bowls with your popcorn and serve. This popcorn will keep for up to a month if stored in a metal popcorn tin. 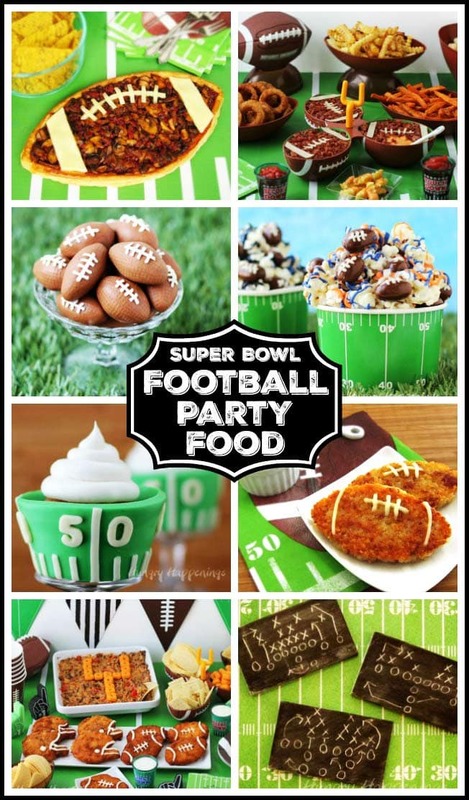 Make this Super Bowl Popcorn with Chocolate Almond Footballs for your next Super Bowl party! 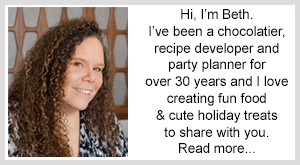 *For detailed information about working with and melting chocolate please see my Chocolate Making Tips page. Pour popcorn into a large mixing bowl. Pour white chocolate over top. Quickly stir it and toss it to coat the popcorn. Pour out onto the baking sheet. Drizzle with colored confectionery coating. Remove and break up into bite size chunks. 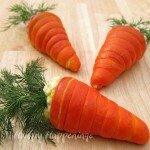 If you are looking for more fun food to serve at your Super Bowl party, tailgating party, or game day event, check these out. Have fun making your Super Bowl Popcorn with Chocolate Almond Footballs. What a super fun idea. 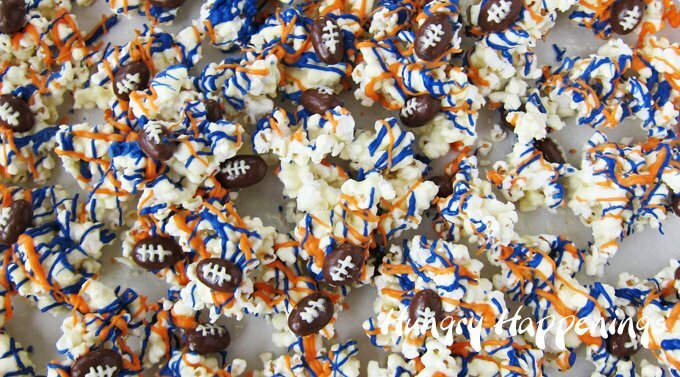 I love how you turned the almonds into footballs and the fact the popcorn is drizzled in blue and orange, it’s a perfect combination!